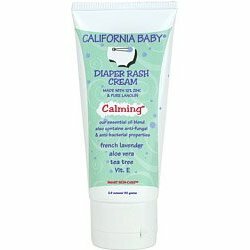 I have the unnatural love for my California Baby Diaper Rash Cream; any hint of redness on my baby’s bum; I slather on the cream and viola! It’s gone. It’s also used under the chin because my little one has folds of chin and moisture seems to get trapped under there. The funky smell and the irritation is supposedly common in chunky babies; My pediatrician recommended vaseline and hydrocortisol cream, but I am not a fan of petroleum made products. I read the back of California baby which claimed its anti-fungal ingredients so I tried it. Totally worked. I also loved how it’s food grade so I felt it was safe enough to use around my baby’s face. I wouldn’t recommend putting it on where your little one can wipe it off and put it in ones mouth; but the triple chin on my little one did come in handy. *** The Evidence of Triple Chin and how easily moisture collects there. It does contain 12% Zinc Oxide and also Lanolin, so it’s not 100% au natural. However, for it’s wide availability (I bought mine from a local grocery chain with the Organic section) and it’s workability; it’s highly recommended. The Calming formula is made with essential oils, chamomile and French lavender in which both are touted for their calming properties. I can’t wait to try rest of the California Baby products; especially the Sunscreen. Me thinks that Eco Chid’s Play is a huge fan of California Baby line and I am not the only one who has the unnatural love for them! I had tried several baby lotion found in generic supermarkets and stores and I remember I liked them until I did research on how many chemicals are in them. I dont want those chemicals on my baby’s skin!! I use the Made from Earth skincare products now for my kid – specifically the Lavender Calm lotion. I am loving it because it does not have a penetrating scent…any lotions that smell too strong like fragrence have too much perfumes makes me wonder about the hypoallergenic claim. Since Made from Earth doesnt use chemicals or fragrances all their stuff is hypoallergetic…go for the Lavender Calm lotion if you are looking for a great Non Toxic baby lotion. . . Birth By Surgery: Can the C-Section Be "Natural"?